Make it a round of “Party Rock” for everyone! 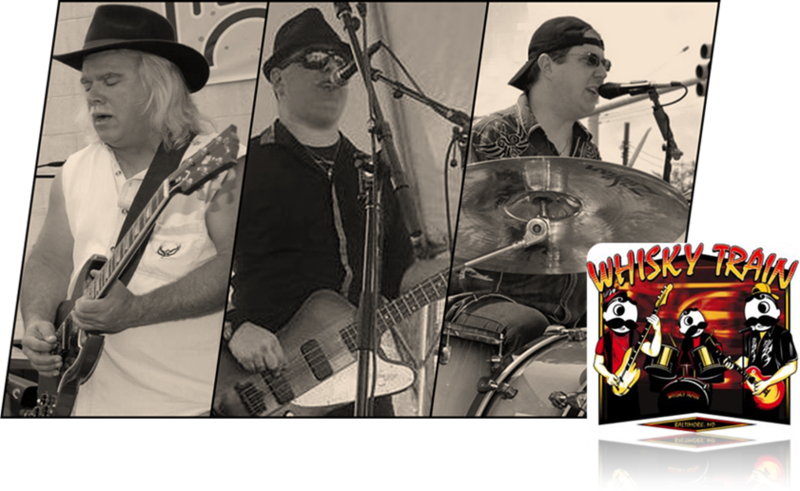 Established in 2002 by brothers Mike & Dave, Whisky Train has been rocking the Maryland music scene for over 15 years. With an ever‑changing songlist, the band covers all the tunes that make you wanna get up and shake what ‘ya got. Performing one of the most diverse selections of music around, any given night can range anywhere from 1950’s rock & roll, straight through hard and modern rock covers depending on the crowd, venue, or event. Our selection of songs is sure to please any crowd of many ages and musical tastes. Check out our songlist and see for yourself! From large concert halls to the tiniest corner of a local dive, we’ve done them all…no stage is too big or too small. Our three-piece act can easily adapt our setup to accommodate any size venue. In addition to our full band show, we also offer an all‑acoustic show which is perfect for deck parties, happy hours, and smaller/quieter settings. And when not perofrming full band shows, Mike & Dave perform as an acoustic duo, as well. Over the years we have the privilege of opening for many national and regional acts in the area including Eddie Money, Three Dog Night, Kix, Funny Money, Robin Trower, LA Guns, UFO, Roomful of Blues, and Tom Principato. Whisky Train has performed at numerous major outdoor festivals including Baltimore’s legendary “HONFest,” Dundalk Heritage Fair, MD BBQ Bash, Parkville Town Fair, Perry Hall Town Fair, Bel Air First Fridays, Edgestock, Towsontown Spring Festival, and have traveled to Ocean City, Maryland, many times over to rock the resort town! Our CD of original material, Automatic Sin, was released in 2004 and hearkens back to the old days of when rock was all about FUN. The album is available for purchase/download on ITunes, Amazon, CD Baby, and is available at all shows.